It’s officially spring – the time many people spring clean their houses to start over fresh. But there’s another type of spring cleaning that’s even more helpful: overhauling family meals. That’s right. Dissecting all that goes on at meals can help you get rid of what isn’t working and add more of what does. The result? Happy and organized meals the whole family enjoys. 1. Gather Your Go-to Recipes: The first step is to sort all of your recipes. Keep the ones you make most often in one place, like a folder or binder. If you have a recipe that you rarely make, ask yourself why. Also, consider what you like about the meals you frequently make. Once you have your streamlined list, work to add what’s missing. Need more veggie side dishes? Not cooking enough fish? Need more vegetarian dishes? This process helps you develop some working goals and to be strategic about trying new recipes. 2. Clean Out Your Kitchen: After going through your recipes it will be easier to clean out your cabinets and fridge. Be sure to check dates and toss what’s no longer good. If it’s still good but has been sitting in your cabinets, consider donating it. The key is to surround yourself with food you regularly use, making it easier to find what you need. Once you’re done, you can make lists of food to keep stocked, decreasing last-minute runs to the store. Don’t allow grazing between meals, after-dinner snacks or pressure children to eat more. These things actually decrease appetite at meals. Do make sure snack time is at least two hours before dinner, that there is at least one thing at the table the child likes and remind children when the next meal is when they say they are done. These strategies help ensure an appetite for dinner. Don’t provide ONLY accepted foods, pressure the child to eat or label the child as picky. These strategies help keep picky eating alive. Do provide many experiences to learn about food, serve both accepted and not-yet accepted items and allow the child to eat and try food at her own pace (see Satter’s Division of Responsibility). Don’t restrict portions, tightly control sweets or use food to reward or punish. These strategies disconnect children from feelings of hunger and fullness and lead to food sneaking and eating when not hungry. Do provide structured meals at the table, allow the child to stop when full and provide balanced meals with all the food groups, including sweets in moderation. These strategies help children regulate their food intake. 4. Lighten up the Atmosphere: What’s the atmosphere like at meals? Are they enjoyable or do they seem like a chore? Try a more casual atmosphere by serving meals family style. Place bowls of food in the middle of the table and pass around (helping smaller children). This provides less pressure at meals and kids love the freedom of serving themselves. 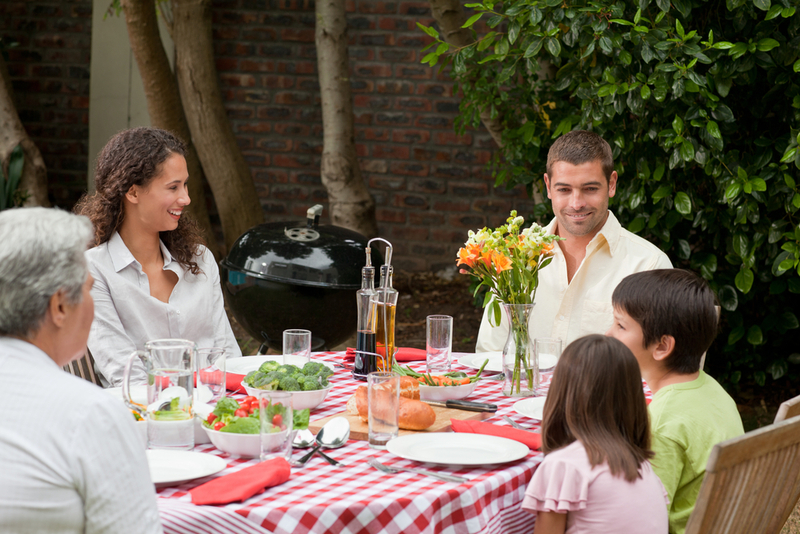 Once the food is served, get a good conversation going instead of focusing on who is eating how much of what. 5. Post Weekly Menus (and Rules): As you get your meals together for the week, consider posting them on the fridge. This way, kids know what to expect and they can even help with preparation and setting the table. Also, list dinner rules like no complaining, no food throwing and bring plates to the sink when finished. Spring-cleaning family meals not only help kids eat better, it makes this important ritual enjoyable for all! Maryann Jacobsen is a registered dietitian, family nutrition expert and creator of the popular blog, Raise Healthy Eaters. Her recently released e-book, From Picky to Powerful: Transform Your Outlook on Picky Eating and End Food Battles Forever, helps parents survive picky eating. She is also the coauthor of Fearless Feeding: How to Raise Healthy Eaters from High Chair to High School.